Pentagon Says It's Staying In Syria, Even Though ISIS Appears Defeated : Parallels The U.S. is keeping its troops in Syria and continues to press for a political settlement to that country's civil war. It's far from clear whether the U.S. has sufficient leverage to achieve that. 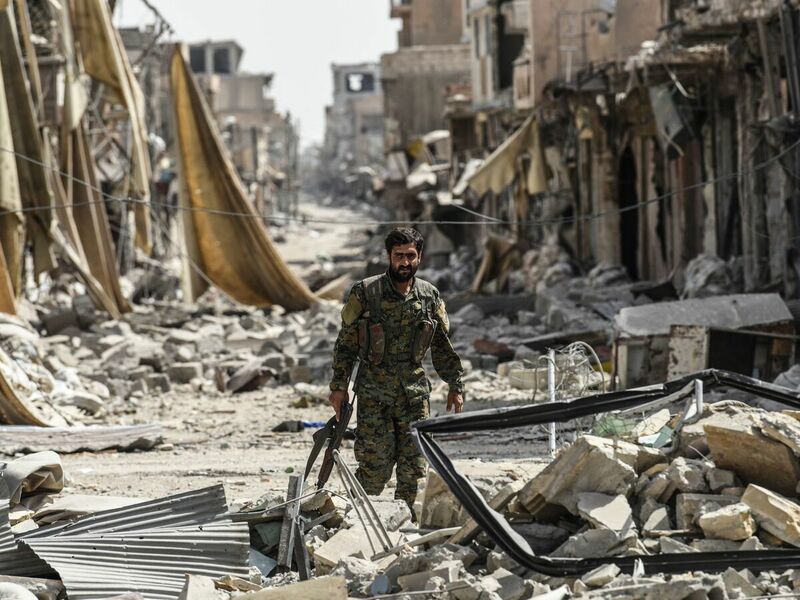 A member of the Syrian Democratic Forces, a group allied with the United States, walks through debris in Raqqa, Syria, formerly the de facto capital of Islamic State. Raqqa, the de facto capital of the Islamic State, is taken and in ruins. U.S. troops and civilian aid workers are in the Syrian city, helping local officials restore basic services such as food, water and electricity. But the recapture of ISIS-held territory in Iraq and Syria is only a partial win for U.S. policy. After seven years of civil war, the regime of Syrian President Bashar Assad remains in power. The other U.S. objectives — the end of the Assad regime, a new Syrian constitution and democratic elections — remain unfulfilled. Despite the defeat of ISIS, Defense Secretary James Mattis told reporters this week that U.S. forces will remain in Syria. The intention, he said, is to prevent the appearance of "ISIS 2.0." There are hundreds of U.S. troops in Syria. Pentagon officials say the U.S. is on solid legal ground to be there because the U.N. Security Council endorsed the anti-ISIS mission. But Russian Foreign Minister Sergey Lavrov says the U.S. presence is "illegitimate." "There are a lot of questions to ask about the United States' goals in Syria," Lavrov said, according to the Russian news agency TASS. "U.S. Secretary of State Rex Tillerson has told me many times that their only goal is to defeat IS." A change in regime "runs counter to the Geneva agreements and ... assurances that the U.S.'s only goal in Syria is to fight terrorism," Lavrov said. Assad and his Russian and Iranian allies are demanding the U.S. leave Syria. The next meeting of the Geneva peace talks is Nov. 28. The U.S. is pressing for the Syrian Democratic Forces and the Syrian Kurds to be at the negotiating table. But it's unlikely that Assad and the Russians will agree to that. With Russian and Iranian military assistance, Assad has emerged as the dominant political and military force in Syria with no need to accommodate his opponents. Pentagon officials say the Russians and Syrians continue to move east toward rebel-held territory. The U.S. is attempting to work with Russia to establish "de-confliction zones," but it's not clear the effort will succeed. What's more, U.S. ally Israel is increasingly concerned about the presence of Iranian forces in Syria, not far from the Israeli border. Russia has rejected both U.S. and Israeli objections to the Iranian presence. Pentagon officials say the U.S. has one asset to advance its interests in Syria — money. The country needs to be rebuilt, and the belief is that Russia lacks the will or the resources to do it. The U.S. is spending money now in Raqqa on what it calls "stabilization" and will likely help elsewhere but hopes Saudi Arabia and the other Arab states will finance most of the rebuilding — in exchange for a political settlement of the Syrian conflict. Yet this would seem to run counter to the Trump administration's aversion to "nation building." A strategy acceptable to Damascus may not be accepted in the White House. NPR Pentagon correspondent Tom Bowman and NPR State Department correspondent Michele Kelemen contributed reporting.